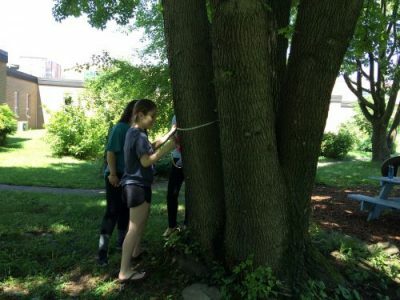 Project Learning Tree’s GreenSchools program is a nationwide environmental service-learning program that gives students the tools they need to make their schools, homes, and communities greener and healthier. GreenSchools also helps students gain real-life experience in a variety of environmental fields, including energy and water conservation, landscape architecture, waste management, and environmental quality. I sent an email to my environmental science teacher to see if she wanted work with me to get GreenSchools started. She liked the idea, but it was her first year at the school so she couldn’t commit to it. So then I sent an email to the principal introducing the program and asking permission to start it. Tip #1: Keep in mind that administrators and teachers are typically overwhelmed with commitments and problems to solve! They may not respond right away, but be persistent – it will pay off! I sent another email to the principal inquiring about the idea. Still no response. So I decided to find a way to introduce the idea in person. Because the principal attends the PTSA meetings, I thought this would be a good way to discuss GreenSchools in person. At the PTSA meeting, the principal agreed that GreenSchools would be a good project! He then arranged a meeting with all the potential stakeholders, including the school district environmental coordinator and the school’s environmental science teachers. At the first meeting with stakeholders, I received permission to start the GreenSchools project! A retired environmental science teacher was at the meeting and she agreed to be the school sponsor for GreenSchools and offered to help get things going. She was already the head of the school’s Earth Force Club and thought this would be a natural fit for this club. In addition, the school district environmental coordinator felt that GreenSchools would be a good fit with other green initiatives already underway at schools throughout the county. These other initiatives include the district’s Get2Green program and the Green Schools Alliance. Furthermore, the International Baccalaureate (IB) environmental science teachers felt that the GreenSchool Investigations would give students ideas for class investigations, science fair projects, service opportunities, and IB essays. They were so impressed with the program and its potential that they both registered for the online GreenSchools professional development training. Tip #2: Keep your PLT state coordinator in the loop. They can provide materials, resources, and local experts to help with the GreenSchools Investigations and professional development workshops. 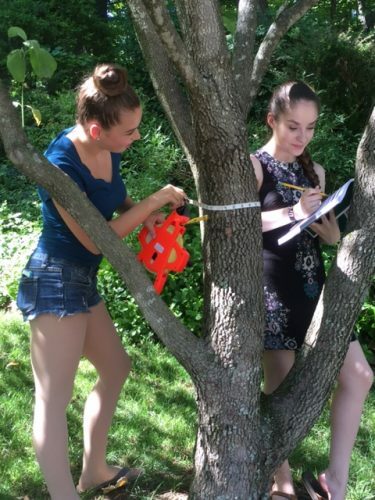 GreenTeam Leaders Dana Dannhardt (left) and Leeann Soyka (right) measure the circumference of a tree on the school grounds to determine the dollar value of the ecosystem services it provides. I held a kickoff meeting for all interested students and teachers during study hall. The meeting was advertised though an email to teachers and text messages to members of the school’s Earth Force Club, Envirothon group, Honor Societies, and Key Club. It was also advertised through posters placed throughout the school. Members from all the clubs attended the meeting and they all agreed that they wanted to participate in GreenSchools. GreenSchools was officially underway with more than 50 interested students signed up to be on the Green Team! Tip #3: Provide snacks at meetings and get students’ cell phone numbers. Students pay more attention to and respond faster to text messages than emails. At the kickoff meeting, I circulated a sign-up sheet to gather contact information and showed the Welcome to GreenSchools! video available on YouTube. I also demonstrated how scientific tools could be used to help complete the investigations, including CO2 monitors, infrared temperature thermometers, and light meters. Oh, and snacks were provided! Scheduling when to conduct each investigation. Tip #4: To help with the Energy Investigation, find out if your school district has engaged an environmental auditor or energy consultant. If so, they should have detailed energy use data and may be willing to provide a behind-the-scenes tour of the school’s energy facilities. At the next meeting, we discussed how to involve additional clubs and classes in GreenSchools. For example, the marketing club could develop a social media campaign to spread the word about ways to save energy, the economics club could help analyze data and potential cost savings, and the computer science club could create a system to record collected data. Tip #5: There’s nothing like a little high school competition to rally student involvement. Challenge a nearby high school to compete with your school to see who can save the most energy in 6 months! Stayed tuned for part 2 of this blog when I’ll share our progress! See the flier for how I advertised the kickoff meeting. Leeann Soyka is a senior at George C. Marshall High School in Falls Church, Virginia. She is a candidate for the International Baccalaureate diploma, which includes an emphasis on creativity, service, and action.